Well hello there, goddess! Gina Rodriguez shined like a burnished goddess over the weekend, and we’re not worthy. 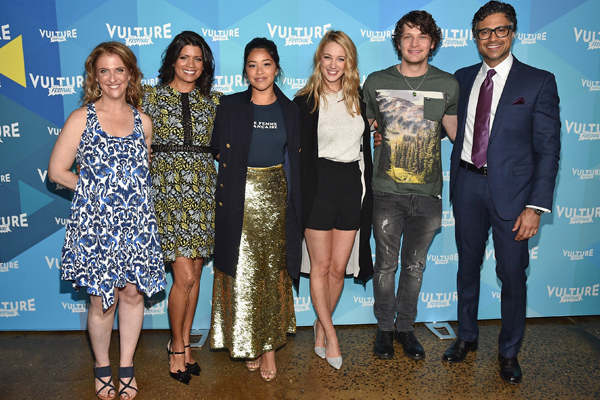 The Jane the Virgin actress opted for a casual, yet fierce ensemble as she attended the 2017 Vulture Festival on Saturday. Throughout the day, the actress chatted about all-things Jane the Virgin. But we’re still in awe over her style choices. She looked both casual and sophisticated in a T-shirt, golden skirt, and sassy coat. “Mermaid life,” Rodriguez captioned a flirty floor picture of herself. With that golden glitter skirt, we’re definitely getting mermaid vibes too, so we approve of this caption! Rodriguez posed alongside her CW co-stars and again caught our eye. With a shimmer, floor-length skirt and navy accents, how could we look anywhere else? While Jennie Snyder Urman, Andrea Navedo, Yael Grobglas, Brett Dier, and Jamie Camil all looked great, the lead of the show definitely wins the fashion award in our minds. Need inspiration on being a fierce female? Look no further, the 32-year-old actress has it down to a science. If her glitter-ific skirt isn’t enough of a statement, Rodriguez’s choice to wear a neutral color on top just heightens the sophistication of the look. Plus, we LOVE her tee choice. It says, “Une Femme Francaise,” which means “A free French woman,” which is SO cool and powerful. Oh, and that navy coat with gold buttons screams “boss lady,” and who doesn’t want to be a boss? And in case you need another reason to love this actress, just look at her smile. She is just the cutest. Honestly, this is making us consider rocking a casual tee and a killer skirt to our next work event. If Gina can do it, maybe we can, too!